Of course, they could always put the notice in a poly bag and tuck it under the wipers. It's not a sticker then and so your warning doesn't apply. Once the bugs are ironed out... can you publish the sticker for reproduction and deployment here? Typo to correct... "Placing one more more stickers". 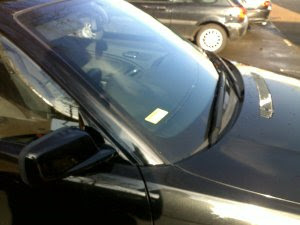 How about "Placing any sticker or notice on the window, under the wipers, or any part of this car..."? Spelling and wording corrected, thanks for comments.